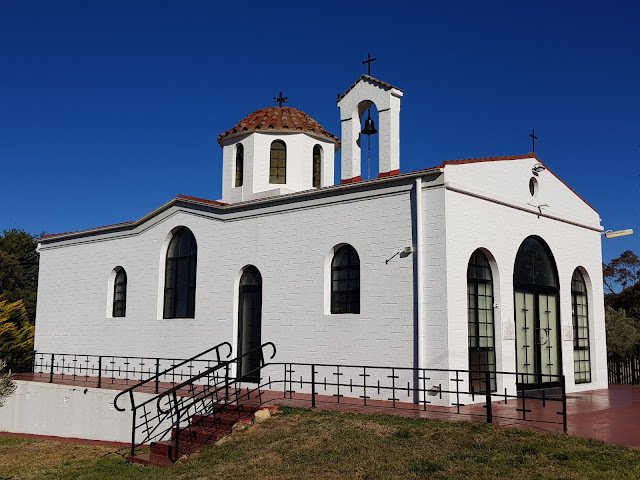 Saint Panteleimon is a Greek Orthodox Church located in the town of Goulburn, 195 kilometres south-west of Sydney. A beauty. I like its simplicity, though from what I know of Orthodox churches, that might well be quite ornate in the sanctuary. What a bright, beautiful church. It looks peaceful and I like the architecture. Are you going to do a Goulburn series? Valerie, I wish I had the time to photograph all the wonderful buildings in Goulburn but it was a quick drive through the town this time. ...lovely Jim, unlike anything that I would see here! And that deep blue sky just adds to the Greek feeling! I thought picture was taken on Greek island. The sky looks Greek too ;) Beautiful capture. that deep blue sky just adds to the Greek feeling!